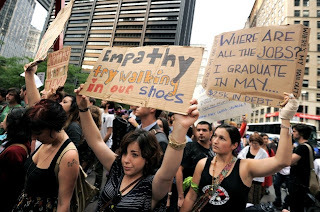 Here is the latest news from Bloomberg which highlights on the Occupy Wall Street protestors who voice out their anger against their high student loans debt. Some of these degree graduates are frustrated that they aren't able to find jobs for months due to poor economic crisis in the U.S. They are also worry about their living expenses which make them more difficult to support their families and children due to their high accumulated student loans debt (including interest rates). Studying degree courses in colleges/universities in the U.S. is getting very expensive. The tuition fee is currently at US$50,000 per year (which does not include your personal expenses, accommodation, books, medical insurance etc.). The tuition fee will keep rising each year due to increasing numbers of the Americans, Chinese and foreign students applying to study in public and private universities in the United States. According to http://www.chinadaily.com.cn/usa/us/2011-07/25/content_12972772.htm, the tuition fee for University of California Los Angeles will likely to increase by 32% by 2012. Currently 18.5% Chinese foreign students are studying in U.S. universities. By Ben Steverman - Oct 21, 2011 4:21 PM PT . William Prince, of Rosenberg, Texas, knows just how inescapable student loans can be. The 52-year-old father of two started paying off $51,000 in college debt 15 years ago and now owes $57,000. "I don't expect to pay these loans off in my lifetime," he says. Prince, a criminal justice major who works in private security, had to defer payments during three bouts of unemployment, and the accumulated interest left him deeper in debt. Americans now owe about $950 billion in student loans — more than their total credit-card debt. The weight of those IOUs is a frequent refrain for Occupy Wall Street protestors and their online supporters. 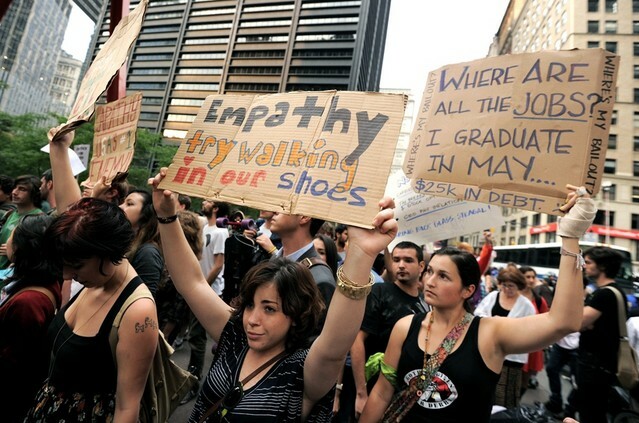 On the "We Are the 99 Percent" Tumblr blog, which features hundreds of pictures of people holding handwritten signs describing their desperate financial situations, student loan concerns exceed those about children, unemployment, and health care, according to an analysis by Mike Konczal, a fellow with the nonprofit Roosevelt Institute. Desperation may have something to do with that outcry. Two out of five Americans with federal student debt can't make monthly payments and either defer, default or are delinquent, according to Mark Kantrowitz, publisher of Fastweb.com, a free scholarship-matching service, and FinAid.org, a source of student financial aid information. Although the laws are gradually changing, student debtors' odds are still grim. The best means they have of one day growing free of those debts is to know the system. There are very few ways to reduce or renegotiate education debt; unlike credit-card debt, few can do this via bankruptcy. "There has been a steady erosion in rights for student loan borrowers," says Deanne Loonin, an attorney at the National Consumer Law Center. Activists and some congressional Democrats argue that Congress should again allow borrowers to discharge student debts in normal bankruptcy — a right lost in a 2005 law. They also ask for better supervision and limits on debt collection. Such improvements could be years away, if they ever take place. For federally backed loans, the situation is better, though still far from perfect. The government can seize wages, tax refunds, earned income tax credits and even Social Security. One of Loonin’s clients, an 84-year-old man, once took out a student loan for a relative; the payments now amount to about 40 percent of his Social Security checks, leaving him with a bit more than $750 each month. The federal government is taking steps that could make the debt burden more manageable. A provision in the 2010 health-care reform law pushed private lenders out of the business of issuing federally guaranteed loans. The 2010 Dodd-Frank financial reform law puts the new Consumer Financial Protection Board in charge of collecting better data and regulating private student lenders. The new agency also is planning to launch an online tool — a "student debt assistant" — to help debtors learn more about their options. One option introduced in 2009 is income-based repayment. It allows borrowers to repay federal loans as a percentage of the prior year's adjusted gross income, capped at 15 percent. (If a borrower's circumstance changes from the prior year, he or she can request recalculation.) Under so-called IBR, all federal loans are forgiven after 25 years — 10 years for those in nonprofit or public service jobs. A 2010 change in the law means that for borrowing that begins in 2014, payments are capped at 10 percent of income and all debts are forgiven after 20 years. Because no payments are required on income below 150 percent of the poverty line, income-based repayment is helpful for such borrowers as 28-year-old Jennifer Sandella. She earns so little that she doesn’t need to pay anything on her $45,000 in graduate school loans. For a single person, 150 percent of the poverty line is $16,335; for a family of three, it's $27,795. Two years after the program was introduced, few borrowers know about IBR. Only about 1 percent of federal borrowers — out of the 10 percent who could benefit — are enrolled, Kantrowitz estimates. The U.S. Department of Education has been offering information about IBR on its website, through customer-service representatives, and to students when they exit school. It now plans to contact current borrowers to inform them about the program, says spokeswoman Sara Gast. The program has drawbacks. Persons with private loans, such as Prince, aren’t eligible. And any unpaid interest is added to debt until loans are eventually forgiven. "I'm still accruing interest at a phenomenal rate," Sandella says. If she never manages to pay her loans off and her debt is forgiven after the 25-year mark, the amount forgiven will be taxed as income, perhaps triggering a big bill from the IRS. Those with private loans have little leverage when negotiating with their lenders. Student loans can be forgiven in bankruptcy only if debtors take lenders to court and prove an “undue hardship” — a legal step taken by merely 0.1 percent of eligible debtors. Of those, about half got relief, according to a 2011 analysis by Harvard Law student Jason Iuliano. The Consumer Bankers Association, which represents private lenders, said in a statement: “Banks work with borrowers experiencing financial hardship on private student loans” by, for example, allowing borrowers to temporarily suspend payments. The best way to avoid being trapped by debt is to restrain it from the start. Students need to "shop around for schools to limit how much they need to borrow,” says Lauren Asher, president of the Institute for College Access & Success, a nonprofit advocacy organization that runs the Project on Student Debt. Regulators and colleges could do much more to steer young students toward more manageable debt loads, she says. “Inadequate information and aggressive marketing tactics can have an effect on people,” Asher adds, noting that many students take on private loans even though they are eligible for less-risky federal loans. Dependent students can borrow up to $5,500 in federal loans as college freshmen, while their parents can borrow up to the total cost of attendance, minus other aid. Colleges are required to provide counseling to student borrowers when they exit school. They "are always looking for ways to do it better," says Terry Hartle, senior vice president for government and public affairs at the American Council on Education. But it's not clear how much of that counseling sinks in. Says Hartle: "I'm afraid an awful lot of college students only learn how much they've borrowed when they begin repayment."